HOUSTON, Late Wednesday night in a construction zone between Southwest Freeway and Beechnut, a chain reaction, multi-vehicle accident occurred. Due to the construction several lanes had been closed, forcing traffic to merge. A car attempting to merge cut off a tractor trailer resulting in the driver losing control of the big rig. The eighteen wheeler struck the car and then plowed into a second semi. A pickup truck was unable to avoid the pile up and also struck the side of one of the eighteen wheelers. 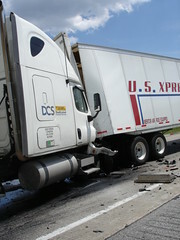 Shockingly, the only person injured in the wreck was the drive who initially lost control of his semi. He was transported to the hospital for treatment of his injuries. No one plans on suffering injuries when they get in their vehicle, but accidents still happen even when all necessary precautions are taken. The average person believes that they will arrive safely on the door step of their intended destination, no worse for wear. When that doesn’t happen, an accident occurs and people are injured; it seems as if the whole world is coming unraveled. This is why our offices are here, to help you in your time of need. Our years of experience and educational backgrounds ensure that we are able to provide the needed guidance and our client focused approach to law means that you will receive the personal attention you deserve. Remember, we are here to help, so contact us 24 hours a day, 7 days a week to speak to one of our personal injury specialists. Call today.